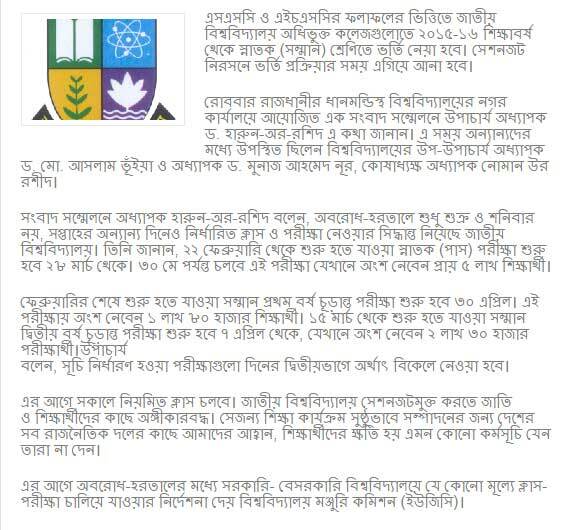 Bangladesh National University is about to publish Honours Admission Release Slip Result on 15th March 2015. NU Honours Release Slip Result will be available in our site as soon as the concerned authority declares it. Earlier a notice was published in National University website to depict that time for apply via Release Slip had been extended. Meanwhile the admission test result was published earlier and a number of candidates were selected. For more updates about National University Admission test Release Slip Result please stay connected with us and be updated always. National University Admission test took place in December last year. The merit lists were also been published earlier. To accommodate more students especially who had not been able to admit in any colleges, the concerned authority had introduced the Release Slip. But many students do not have any idea about the release slip. Release Slip is a form provided to the students who passed but could not able to get admitted in National University. Under this criteria, students who were not included in merit list or rejected first time for the admission could apply for desired subject and colleges to have a another chance. The students were given 5 colleges to choose and apply on basis of vacant seat. However it should be kept in mind that the applicants can only get chance by Release Slip if there is any vacant seat in his/her selected colleges. Otherwise, the applicant will not be admitted in 1st year. National University Honours Release Slip application time had been extended to 7 March, 2015. A notice was issued in March 1, 2015 which demonstrated that National University Honours Release Slip Admission application date had been extended because of internet problem and server failure of authorized website. BUET along with IICT had given the task to sort out the problem. Earlier, the last date of application by release slip was 2nd March 2015. The remaining candidates had the chance to submit their desired subject and College name with a view to filling up the vacant seat as early as possible. By today the application time by Release Slip has also been over. The concerned authority will reconsider the application and allow the remaining students to get admitted if there is enough seat. NU Honours Release Slip Admission will be completed by publishing the final result and a number of applicants are anxiously waiting for that. We will also follow up the result as soon as it is published. So please stay with us and get the latest news regarding this.